This volume consists of numerous texts of the 14th and 15th centuries; they encompass a wide variety of materials, in Latin and French, prose and verse. All but the last two items were bound together by the 15th century, when they were owned by the Carmelite Convent in London. At the top of this page is the end of a list of the towns one passes through if one travels from London to Avignon via Amiens and Clermont-Ferrand. 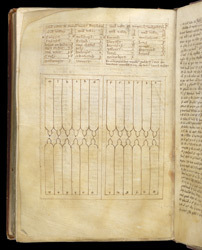 Most of the page, however, is occupied by a drawing of a backgammon board, which faces the start of a text describing various games that can be played with it.